Brisbane-based indie-rock singer songwriter Hallie Tait writes to challenge social norms, share personal experiences and walk in the shoes of those lurking on the fringes of our society. Starting her career late 2017 with nothing but a guitar and her haunting vocals she has since then recruited the members of her band. 19 year old Hallie finds no matter the arrangement, her most honest songs best connect with her audiences. Her ability to both, hide deeper meanings under sarcasm and be completely blunt and say it lis what makes her artistry unique and authentic. Hallie knowingly lets listeners into her world and personal thoughts and mirrors these reflections with the help from her band. With appropriately atmospheric accompaniment and complex Hallie truths people are scared to admit. 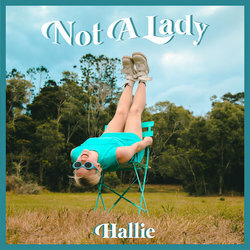 Not A Lady is a wholesome track about a fight Hallie had with her parents about not wanting to shave her armpits.